Prichard2 describes him : Of slight build with a black Mephistophelian beard, bowing a little from the shoulders with an oddly loping walk, Beaton was not an exciting player, but he had a machinelike accuracy, particularly in a three-ball break. Each stroke was played with careful deliberation; when aiming he repeatedly glanced up and down and it was said that he always struck on the ninth nod. 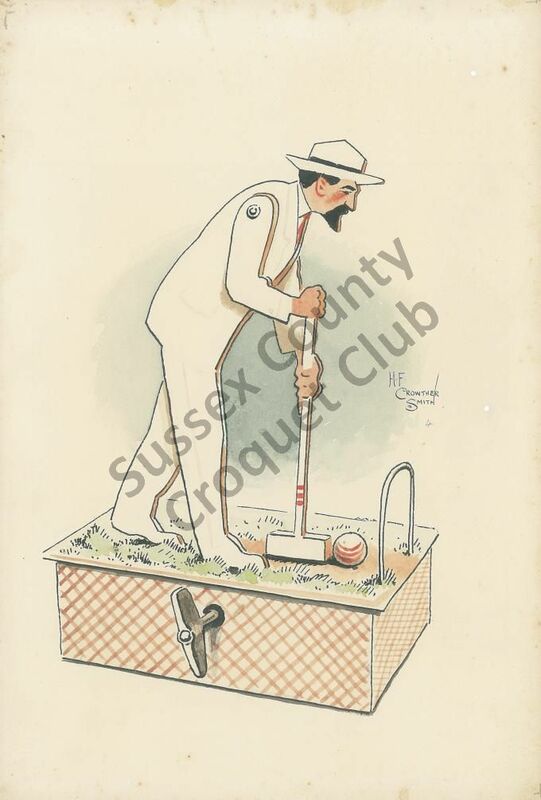 Reginald Beaton (1870-1925 ) won the Champion Cup (1905) and the Open Championship (1904, 1907) and won 62% of all the games recorded in Croquet Records. He played for the thirteenth and last time in the Champion Cup in 1923, but died suddenly in January 1925, still a comparatively young man. He is included in group photographs in Prichard pp 73,74 and 81. At the end of 1905 he married Lily Gower (1877  1959) who had beaten him in the final of the Open Championship that year; she also won the Men's Gold Medal causing the committee in 1909 to ban women from competing! (Prichard has a full page photo on p69 and an interesting discourse on her winning men's titles p70). Mr & Mrs Beaton were a formidable doubles partnership. After Beaton died Mrs Beaton continued to play but though less successful was always a force to be reckoned with. In 1929 she became woman champion for the first time since 1901 and in 1948 she won the Peel Memorials for the second time after a gap of forty-five years. She continued to play until her death in 1959, aged eighty-two. Board 183 x 268 mm supplied by C Robertson & Co with the paper similar to Whatman. A second board had been attached, on the long edge and possibly as the backing in a frame. A couplet has been written onto brown or faded paper from which a clipping has been stuck to the back. Label on the back No. 2513 (title 4). A paper strip on the reverse of the main board, has obscured the end of the original couplet which has been supplied only on the cover board. The drawing is slightly foxed at top and bottom and a little on the R side. There are two pinholes towards the R side (mid & top) which have been filled neatly with white pigment.